It’s time to get ready for summer, and Stride Rite is having an awesome sale starting tomorrow, May 26 and running through Tuesday, May 31 at participating Stride Rite retail stores and striderite.com. 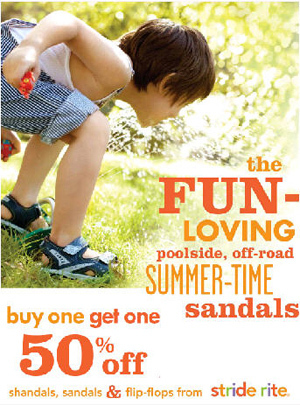 The sale is for Buy One Get One 50% Off ALL kid’s shandals, sandals & flip flops from Stride Rite. If you are shopping online, use coupon code is: SUNBOGO. To help kick off their sale, Stride Rite is offering one lucky LRWC reader a free pair of children’s shandals, sandals or flip flops. Head over to the Stride Rite’s website to check out all the cute shoes, sandals and more. Find a Stride Rite store near you. Entry: Place a comment below and tell us what your kids will be doing during their summer vacation? You must supply a valid email address. Email addresses should be put in the private field and not in the public comment box. The giveaway ends on Friday May 27 ending at 8pm EST. No entries will be counted after that time frame. A big thank you to Stride Rite for providing this giveaway. Going to the pool everyday. Disney, a cruise, and summer camp. Hanging out with my mom in the pool! My son, he’s 5, gets to spend most of his summer vacation with daddy this year. His mom & I are divorced and we share equal custody but this year she’s going on multiple trips so he gets to spend more time with me and we’ve already bought new water guns and this is his first year for swimming lessons too! EXCITED!! My kids are attending a summer camp in the mornings and then we’ll hit the local swim club most afternoons. We’re also going on a week’s vacation at the Jersey Shore in June and again in August. My son will b going to the pool and attending VBS! My kiddies will be busy….basketball camp, summer fun camp, karate lessons, swimming, trip to Hershey Park, Storybook land, Myrtle Beach, and the Jersey Shore!! It’s going to be a fun summer for them that is for sure! Going camping to see the stars! Thanks StrideRite and LRWC!! My son Ryan is 5 years old and turning 6 this summer. While sadly I will be at work all week, he will have the luxury of living it up at Grandma’s during my work hours – this means, lots of parks, pools and fun! We are also planning a few amusement park trips and I plan to enjoy every minute of the summer fun I can with him. Water guns, bbqs, and lots of outdoor sports!!! Going camping and seeing the stars! Thanks LRWC and StrideRite! My son will be taking his first vacation to the Jersey Shore this summer! We will also be at the pool a lot this year! Summer camps and pool time along with a trip to WDW! Hanging out with friends, playing at the beach! My twins will be attending camp this summer. We love stride rite…especially their BOGO sales. I especially love the stride rite in Garden State Plaza. The store manager, Jessica, is so easy to work with and extremely helpful! I’m hoping to take my kids to the Hershey Chocolate Museum (who doesn’t LOVE chocolate LOL), Hershey zoo, Philly zoo, Crayola Factory, and the Bear Mountain Butterfly habitat……that’s just for starters! We may add Knoebels Amusement park to the mix! Did I mention ice cream at the local dairy bars??? YUM! This is the last summer before my daughters start Kindergarten and PreK, so we will try to get as many fun things in as possible. We plan on going to the park often, swimming, exploring, playing in the yard, and anything else we can! We love Summer!! We have lots of swimming and library programs planned! Going to enjoy the beach for the first time! Exciting! We’re headed down the shore for lil guy’s first trip to the beach! Hope he likes it and also doesn’t eat too much sand…LOL. My kids will be doing a ton of swimming at my Mom’s pool. My oldest son will be doing lots of reading too! Will try to stay cool at the kiddie pool at the local park and at the beach. Have some day trips planned for the zoo and NYC. My oldest will get to go to music camp for a week in August. And of course, our local library has a fantastic summer reading program filled with lots of fun activities. Getting ready for kindergarten and a baby brother!! Lots of fun in the sun and day trips to as many beaches as possible! My 4 and 5 year olds also want to Learn to ride their bikes without training wheels, jump rope & take hula hoop classes. My son who is 3 will be seeing Thomas the Tank Engine and going swimming this summer. We will be having lots of play dates, going to the beach and enjoying long evenings playing in the backyard. I’ll be at work, but my 5-year-old daughter will be going to the summer camp run by the Rec Dept. in our town for 8 weeks, and the rest of the time she will be spending at Grandma and Grandpa’s house wreaking havoc on their relaxing retirement years! My kids will be beachin’ it up all summer long! Gotta love Jersey beaches! Playing on her new swingset and in her new sandbox! My children will be enjoying a beach vacation, bicycle riding and just loving not having to get up early for school! My kids will be enjoying NOT having homework 🙂 Also spending 2 weeks in Cape May in August! Hanging out with family and friends, swimming everyday – pool or the beach which is just 5 minutes away! Will be great fun. Lots of park time and pool time at Grandma’s! My three children are going for the first time to the Jewish Community Center camp that is located in Medford, NJ. I think the kids are going to have an awesome time at camp this summer. They definently will be enhancing their swimming skills and enjoying various camp activities. Summer camp, a trip to Disneyland & a visit with the grandparents. This is the first summer in a long time that I will not be working, so my girls and I will be spending alot of time at the park, pool and at the beach. We are also planning on taking them to Williamsburg, Virginia to visit Busch Gardens and water country USA. Swimming, VBS, having fun at the various parks where we live and maybe a couple days at Disneyland (fingers crossed). It’s going to be a stay-cation this year. Although, we are hoping to take them to zoo and local amusement park. My little guy calls his sandbox “the beach”…LOL…so we’ll be spending time in the pool and “the beach”! We are lucky enough to have a beach house at the Jersey shore so my little girls will be spending lots of time playing in the ocean & building sand castles!! My boys will be digging in the sand, swimmin in the lake and going on a family vacation to Florida! My 2 1/2 year old daughter and I will spend a week in Martha’s Vineyard this August with Grammy. This is our 3rd annual trip and she LOVES going. Each year gets more exciting as she gets older. I am also planning to take her to the Butterfly Garden in MA during the July 4th week! I can’t wait for that. Probably having losts of fun destroying all the pretty shoes that I buy them! 🙂 But hey, that’s what kids are supposed to do! Going to Nana’s pool, Art Camp, VBS, riding their pony and getting a new baby sister!! Probably having lots of fun destroying all the pretty shoes I buy them! But hey, that’s what kids are supposed to do! Raela will be going to tweetsie railroad to see Barney, going to the pool,going to the beach , going to the VBS and going to puppet camp! The whole family will be learning to swim. And going to lots of BBQ’s! Summer camp since I am a working mom. We are going to be hangin’ at the beach! Lots of swimming and running around in Stride Rite sandals! My kids this summer get to hang out with daddy (hes off too) and play in the yard and the local park!!! My children will be having fun at the Bronx Zoo, Aquarium, several museums, parks, beach and to top off the summer we will be spending two weeks in Nicaragua with their paternal grandparents. Going to the Outerbanks, NC!! yeh!! Pool time at Mamaws, Bible Camp with the family and Vacation Bible school! my boys will be spending time at the library (they have a ton of free programs), the pool at the Y, and hopefully the beach several times. My 10 month old grandson will be going to St. Petersburg, Florida for his very first beach experience!! We are very excited to see him play in the ocean and sand! My kiddos will be relaxing.playing by the pool and reading their favorite books. My kids will be playing in the water a LOT this summer! We work at a sleep-away camp in the Poconos, the kids have a blast in the day camp there program for staff kids. We will be spending lots of time at beautiful White Meadow Lake!!!!! We live 15 minutes from the Land of Make Believe so I am getting season passes and that’s where we will be when daddy’s at work and we want to have fun! Playing basketball and baseball with Dad over the summer! We will spend as much time as possible at the beach! Getting to know each other: one is brand new!!! Besides driving their mama crazy, the kids will be running around the yard! WooHoo! Now that I work for a school district I will be enjoying “summer hours”- work day ends at 2PM. Plenty of time to scoop the kids up and head to the beach or pool. We will also be visiting the Cape May Zoo and of course, the Boardwalk! Lots of playing outside…and hopefully some camping and moving to a new home! We love Stride Rite shoes! We live at the Jersey shore so we will have plenty of beach days, days at the ree water park, the regular park, camping, BBQ’s with family! My youngest who is five will be spending his summer in our pool is the backyard so the sandels are the only things he wears in the Summer. Our family has been wearing Sride Rite shoes since they were born!! My kids will be riding bikes and swimming. Playing t-ball, gymnastics, going to a baseball game and riding bikes! Summer camp a trip to hershey park, camping and ofcourse the beach!!! My grandchildren will be playing with bubbles, going to the park, going to the zoo, and just having fun outside. We live in a lake community so we are at the beach just about every day when we aren’t at swim team practice and meets. My little guy is turning 1 June 5…baby needs his first pair of shoes! Lots of time in the pool, and a summer dance camp! We’re going to take our daughter to the beach for the first time. She was born last summer so missed out on all of the summer fun, being a newborn and all. But now she’s a walker and loves to explore and I know she’ll love the beach. My son will be taking his first swim lessons at 20 months old! We live near the Jersey Shore so my days will be filled with going to the beach or mother-in-laws pool and the spray park! Our son will be playing at the beach, the local zoo, and the seashore playground, and getting ready for a baby sister! My kids will be playing outside with mom all summer! They will be enjoying feeding baby animals at a local petting farm. My boys will be spending their summer vacation playing in the pool, going to the park, going to the boardwalk, and playing outside. My son will be visiting with family and enjoying the pool that’s in our backyard. He also loves playing with the hose. Sesame Place, Beach, pool time!! Lots of fun stuff planned. I am actually a little scared of what the summer will hold for the kiddos…. I know we are planning a day trip to Atlantic City and the Staten Island Zoo is free on Wed afternoon so I will be there a few times..other than that it is up in the air, which is why I am scared! Nice to see a fellow Staten Islander reading LRWC! My kids and I will be spending the summer swimming with friends and hopefully lots of time at our camp in the mountains. I am recently unemployed so anything more than that is pretty much out of the question. Both of my kids could use new shoes. It seems like they both just grew out of their shoes out of nowhere! My son will be going to camp for couple of hours, then we will head out to swimming pool. I hope he will not spend too much time on Wii. My kids will be hanging out at the pool this summer. Hopefully we will be able to get to the water park and visit family…not easy with three little ones. My son is going to a new camp this summer, with lots of fun activities planned! It works out well because I work f/t. His best friend will be in the same camp. On the weekends, however, we will be heading to Island Beach State Park, since I have a pass and we live @ the Jersey Shore. Can’t wait! I think we are going to visit the zoo and aquarium this summer. We’re going to take a family vacation to Chicago to see some family and go to a Cubs game! My son is going to turn 1 soon…… july. We are going to India to celebrate his first bday with family who have not met him. Swim lessons, tennis lessons and lots of outside play! Lots of bike riding and playing with water I’m sure!! Enjoying our new house and yard by planting a garden, playing with water hose and sprinkler, and enjoying our new swing set…I am sure that there will also be visits to the zoo , the train exhibit, and most importantly the grandparents house!!! My kids will be doing sports and summer in the park programs this year. My little boy will be playing with his new outdoor toys! Lots and lots of walking, biking and playing at the nearby park. 🙂 We’d love to visit Central Park too like we did last summer. Grammy’s house 5 hrs away for two weeks. Camping for a week, and a lot of activities I’m sure! my two kids will be going to the pool a lot! My little guy will be exploring our own backyard. He’s going to be my garden helper and the neighborhood dardevil as he rides down the sloped driveway on his little car!! I’m sure the zoo, aquarium and children’s museum will break up all that fun too! We have 5 boys! My oldest is just turning 15, so he’ll have a few free days a week for free time w/friends..movies and such. We purchase zoo and waterpark memberships ahead of time, so we’ll be alternating those trips with daily park walks, family visits, swimming, fishing, and our yearly shore trip. My younger boys range from 2-6..so the idea is to have something for everybody to do! The less I keep them in the house..the less I have to clean up!! A FREE, cozy pair of Stride Rite sandals for one of my boys would be greatly appreciated!! I am not quite sure what this summer will hold for our family . Having now a addition to our family, Tyler ( 1yrs ) and Anthony (3yrs) should be interesting. We are going to attempt to do one weekend of camping see how that goes first lol. But Stride Rite shoes are the best my older boy loves his shoes from stride rite.. This vacation my oldest is going to summer camp with the boyscouts and my 2 youngest will take swimming lessons and also will get to try horseback riding thanks to a groupon deal :))) We will also go to Dorney Park as we got a deal with the boyscout troop for 20$ per person. Trying to budget all the fun we can get !! Lots of visit to the library as they have plenty of fun activities. Had one vacation already this year so the summer we are planning to visit relatives, swim, camp, play at the lake and BBQ a lot! wow, this is so neat! would love to get one of their shoes for either of my kids. We will busy with so many fun activities like the zoo, aquarium, playdates with our friends, outdoor activities… We are so excited for a summer of fun!!! We have season passes to Six Flags, so lots of trips there, to the beach, and we have a vacation to Virginia Beach at a friends beach condo and a week in VT with the family!! 🙂 We definitely could use a pair of sandals for my younger son!! We are going to be staying at home, and enjoying summer and then going to see my family (we haven’t seen them since Christmas):) Thanks so much for a great giveaway and thank you to Stride Rite too! We will be spending a lot of time at our lake with my niece and nephew. We will also be making trips to Space Farms Zoo in Sussex County, where we are season pass holders. We will also be going to Sesame Place (free tix from Pampers points!) and the Bronx Zoo. Besides day trips, we will also be taking a trip to St. Louis and the Ozarks to see my family and a wonderful trip to Wildwood Crest with my in-laws. All of this wouldn’t be possible without all of the saving I do with the help of this wonderful website!! Thank you! DD is in her toddler phase now (18mths) and we are looking forward to lots of fishing and playing at the park when she is not in daycare. My daughter will be going to the pool a lot with mom and learning how to walk. 😉 She is 10 months of fun! I am new to couponing and my dear son actually gets excited when we go out on our shopping trips. He is only 6 years old and tells his friends about coupons. This summer he is headed to day camp with football practice most evenings, weekend travel, loads of birthday parties, and outdoor play time. He tells me that exercise if important especially when he wants to run through the outdoor fountain at the local grocery store (after he eats his free cookie). Summer fun. We are heading to the Shore twice then down to see Mickey! My kids will be playing soccer & chillaxen by the pool and hopefully reading books! We will be spending a week down the shore, and some day trips here and there. unfortunately I work full time , so does my husband so we take the kids out mostly on weekends. We love going to the park,zoo,and day trips to the shore. During the week they are with the babysitter, we have a inflatable pool in the yard and they enjoy playing with their friends. This entire summer will be a “staycation” for us, with a possible weekend up to Lake George. We will pass the time gardening, playing in the sprinkler, going to the park, and playing with the train table at Barnes & Noble when it gets too hot. They are going to camp and daycare. I hope to do some day trips as well. I will be keeping my son (6) and daughter (4) as busy as possible! Going to Grandma’s house in South Carolina, a 14 hour road trip! Visiting the Springfield Museums for their wonderful kids programs. Spending lots of time at the park and nearby stream for playing and cooling off! And let’s not forget play dates. I should be happy to see school start in September LOL! This summer my son will spending lots of time with his grandma and grandpa, as we will be living there while looking for and hopefully finding a house. We will be looking for fun things to do while waiting for our new addition to arrive so Zac can become a big brother! We will be spending 5 days on Maine’s coast checking out all the beaches! Then we will be spending 2 days in Boston enjoying some shopping and site seeing! Other than that we will be spending lots of time with family and friends. My brother-in-law is getting married towards the end of summer, so we are looking forward to that! This summer my son will be swimming at the pool of our complex (hopefully!) and playing with his friends. Hoping to squeeze in a trip to Land of Make Believe also! My kids will be at the pool a lot. The older one will have swimming lessons at 9am in the morning (yes, that is early for Summer vacation but that is the only option for his swim level and I will be up anyway since my little one never lets me sleep in!) By the way, this giveaway is great – both my kids are hard on their shoes. Besides Summer Camp where my son will be horseback riding, playing soccer, and going to fun places like Bounce U, we have plans to go up the mountains and to Walt Disney World! Its going to be a busy summer and I’d love to start it off with a free pair of shoes for him from Stride Rite!!!! My son will be doing all kinds of stuff. Travel with our family, a few weeks of day camp, swim lessons, going to our pool. Looking forward to the start of summer! My son is signed up for summer camp and pool. We plan on taking long nature walks, heading to the beach, travelling to Europe with a group of my high school students (!!) and lollygagging about….for all of these things, my two boys need good, solid, Stride Rite sandals!! Thanks for all of the great tips on here!! We already have swim lessons lined up and a trip to the Philadelphia Zoo. First time for that!! My baby is only 5 months now, but I am impatiently waiting to see him wearing his first shoes!!! This year I’m teaching my kids to swim the right way (no doggy paddles!) so we’ll be spending most of the summer in the water! I homeschool my four little girls so we have spent the last couple weeks testing and finishing up this school year and are looking forward to a much needed break! We will spend the summer gardening, going to the beach on occasion and enjoying our sprinkler! Definatly a stay-cation kind of summer for us! My kids are going to be play play playing all summer long. My daughter will be playing with her new trampoline, swingset and getting ready for her baby brother or sister to arrive the beginning of july! We will be going to the beach, up the mountains and on a mini vacation to Washington, DC with our five year old! My daughter will mostly be camping and hiking, and a lot of swimming!! Our four kids will be playing at the pool a lot and also on their new swingset! My son will be spending his first summer as a toddler swimming in our pool and taking trips to the beach. We will try out some boardwalk rides and maybe head to Six Flags! We may even get his feet wet with standing on a surfboard with my father in law! We have a whole variety of things this summer. A few vacations to visit family… a week here and there of summer camps… trips to the library for the summer reading program… visits to grandmas (often) because she has a pool in her backyard! My kids will be taing swimming lessons and enjoying their first summer with no daycare!!! My oldest child is going to a free soccer camp, we are going to VBS, the park, the library and hopefully lots of running (and with this heat, we can surely add swimming). A new pair of shoes for any one of my 3 growing children would be GREATLY appreciated!! One word describes what my kids will be doing this summer and it is BEACH! We live 10 minutes from the beach and I plan on being there at least 4 days every week. We just went the other day and the kids were already in the water! Well, my little guy is having some trouble in school so he is going to have to go to 1/2 day summer school for the month of July so we are going to make the best of it in the afternoons by going to the park, swimming in Grandma’s pool, and just having as mush fun as we can crame into a short amount of time. Hopefully, we will be able to go to sesame place, and possibly a trip to visit family in Florida in August. My 20 month old and I will be busy getting the house ready for the new baby I am expecting in August. We just moved to the middle of the desert (thank you, USMC 🙂 haha) so there isn’t much to do. We will probably spend a lot of time in her baby pool when it’s not too hot out. My boys will be spending the summer running through the sprinkler and chasing the dog. They will also be playing in the park and spending lots of times with their grandparents on the beach. Our family will be spending the summer at parks close to home. We are planning a trip to the ozarks for vacation and also maybe a trip to go to indy to spend with my best friend and her little one and lots of swimming this summer at our own small litttle pool and some waterpark is in store as well. my three kids would love a new pair of shoes as they will be busy little bees this summer so anything free from stride rite would be awesome!!!!!! Summer camp and more camp. Running jumping playing and exploring all day! hopefully enough that they will be tired when they get home from all the running around and rest peacefully so I can! My daughter will be learning to walk and get in all sorts of new types of trouble! Some trips to our beach house in LBI, an orchard near our house, and maybe even a week or 2 in Florida? My kids will be spending the summer with me! Couponing! Just kidding….I’ll be doing that while they nap. Because I’m going to take them to the area pool everyday so they can wipe themselves out. Oh how I love summer naps. My husband is off for the summer so he and the baby (can you still call an 18 month old a baby) will be going to the park, riding bikes and splashing around in her kiddie pool all summer. My little guy just turned 1, so he will be having lots of “firsts” this summer…playing at the park, going to pool, the zoo, and playing in the sand and water at the beach! The kids will be at the beach and maybe summer camp, I’m not sure yet…definitely a trip to NC to visit family! We will be spending lots of time down the Jersey shore. My husband and I are both teachers, so we will have lots of time to spend w/ the kiddies! Im going to school over the summer, but when im not we plan on doing lots of crafts and lots of camping. Our summer doesn’t start for another month since we are on the “continuous calendar” (year-round). But, we are hoping to go on our first BIG family vacation this summer! My kids will be enjoying the beach, hopefully a pool in the yard and lots of friends. We are moving to a family friendly neighborhood. Kicking off the summer with a week long trip to Disney World. July hold Extended School Year for my son with Autism and the Summer Recreation camp for my daughter (hoping for swim lessons on off days). We’ll see what August holds for us besides the backyard pool, sprinkler, and the local park / playground. My little one will be going to the beach and park a lot! We’ll be making our yearly family trips to Lake George & Wildwood. Lots of days trips planned too. We plan on utilizing the sprinkler and swimming pool for cooling off on these hot hot days to come. Hopefully we will be moving to a new house and during the super hot days we can be decorating, painting and organizing the kids’ area too! Because we live in the country I hope we win so we can buy some much needed summer sneakers! Yay! Unfortunately my son will be going to summer school 🙁 but hopefully we’ll be able to make it up north a couple times, education comes first, rigwht? My kids will be hanging out with daddy at home. Hopefully we’ll get in a few fun things! My little guy will be spending a lot of time outdoors. He is currently obsessed with sports, baseball, basketball, he doesn’t know nor care that he is only two and small for his age. He will also be spending a lot of time at the local zoo since we have a membership tanks to Groupon savings! My son and I are headed to Hawaii to be in my sister’s wedding in September! So all summer we are planning, scrimping, savings, and having yard sales until we get on that plane! My son will be spending his summer getting to know his new baby sister who is due any day now. Should be a great summer!! It’s his first real summer (he’s just over 1) so it will be adventurous I think! My kids and I will enjoy lots of time at the pool and playing with friends. This summer should be insterting with my 10 year old and my 1 year old…..This summer we will play baseball outside and in tournaments, Go on vacation to Myrtle Beach, Swim, play in the dirt, play with friends and cook out with friends and family….Also my oldest will be reading some books over the summer. Going to practice swimming at the local pool. My newborn (who is an awesome sleeper– score one for me!) will probably sleep the summer away while her older sister chatters in her ear all day (and night) long. This summer is going to be interesting for us, this is the first summer that I have not been working full time. I have both my 8yr old boy and 1 yr old girl signed up for free bowling during the summer. I will be taking them to the pool to work on their swimming, to our local zoo to help feed the animals, to the movies on free kids movie days, and I am looking in to some high active sports for my son. I am really excited to be able to spend this summer with them. We will be doing swim team this year – every morning M-F. Plus 2 weeks at Rehoboth Beach, 1 week at Myrtle Beach, and 1 week of science camp. I’m sure the summer will fly by! My kids having swimming, biking, rugby, soccer camp, and a few trips to the cottage on the lake to look forward to! My son is only 6 months so I plan to get him acquainted alot with the pool! he loves water and we can’t wait!!! My daughter will be swimming, dancing and causing has much havoc as possible! lol My son will be soon taking his first steps, he is in love with the pool! We are planning on having a very FUN summer! My kids and I will hit the pool, parks, library, and the Zoo! My daughter and I will be going to the beach for a week with family. Also, we will be spending lots of time at the park and pool. Her birthday is in August, she will be 2 years old, so we will have a big party! My 3-year-old will have an extended school year in his preschool autism program. We need to find another program to help him through the rest of the summer. Plan on spending a lot of time with him and his 1 1/2 year old brother swimming and visiting with family. Swim lessons and lots of outdoor playing!! We live near the Jersey shore so we’ll be in Ocean City as much as possible. Cheer camp in the Pocono’s for my daughters! My kids will be spending lots of time outdoors, playing and helping their daddy with yard work and the garden. My daughter and I will be spending our summer at the pool. This summer we hope to visit the beach often, and hang out by the pool. Maybe a few day trips here and there. Well, since I have been out of work for quite a while, the kids won’t be doing too much this summer. Fortunately, we have a swimming pool and plan on spending long days outside. We also live less than an hour from the beach so I am sure we will be making trips there for beach and boardwalk time. We will also be having a 3rd birthday bash on Labor Day weekend for our littlest one. We will be spending the time together as a family, biking, day trips, swimming, weekend trips, and hanging with extended family. My daughter, 2 years, and I will be taking a road trip from upstate NY to Idaho and Washington to see her grandparents, great great aunt and uncle and some close family friends before heanding back home to welcome her daddy, my husband, home from deployment. My children will be going to the Outer Banks and spending lots of time at the pool this summer! My kiddos will enjoy some fun in the sun plus two vacations, one to the beach and one to Georgia to see their grandparents. My kids will be swimming, camping, going to BBQs and birthday parties vacationing at the beach, and one will be attending summer camp. My boys will be spending time with mom before she goes back to school too and before dad leaves to training we are going to go to as many festivals we can go to and learn about responsibility with the new dog we rescued from the animal shelter. My granddaughters will be spending all of my days off work with me this summer ( mostly Mondays) We will swim, roller skate, go to the movies, and play at the parks in the area. We will also spend time having sleepovers at Mimis’ (my house) on the weekends ! My family will be heading to North Wildwood, NJ for a week or so. After that, we’ll have a visit to Story book land, swimming and lots of outside fun! My four year old and I will be trying the beach again this year. We have tried for the last 2 and he has yet to take a step on the sand. He does have sensory issues and we hope to stomp them out this summer! !